After a 34 year hiatus, football finally returned to Dalhousie University in Sept 2010. 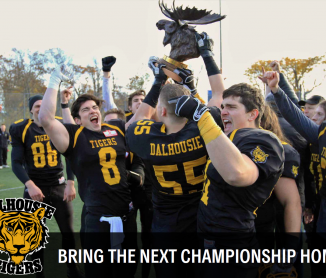 The Dalhousie Football Club entered the second season of the new Atlantic Football League (founded in 2009) and competed against the UNB Fredericton Red Bombers, UNB Saint John Seawolves, Holland College Hurricanes and the Moncton Mustangs. This was made possible by the leadership of some keen Dal Alumni, our volunteer coaching staff, the Student Football Club Executive and our players, along with the financial support of our Founders Club and sponsors. The Dal team is the only team in the AFL that requires all of its players be full-time. After making it to the Moosehead Cup finals twice, the Tigers won their first AFL title in 2017 during the team’s 70th anniversary. The 2017 Tigers went on an 8-0 undefeated run, outscoring their opponents 306-33.